wish it lasted longer. Today I have done a super simple, Christmas morning look. Perfect for a fresh, morning/day time face. I did this look in about 15 minutes. I hope you enjoy!! NARS Pure Radiant Tinted Moisturizer in Terre Neuve applied with my hands. Bobbi Brown Corrector in Porcelain Bisque (Out of the Bobbi Brown BBU Palette) under eyes. Bobbi Brown Creamy Concealer in Ivory (Out of the BBU Palette) under eyes. I used Palace of Versaille and Chantilly Lace on my brow bone and inner corners. I then used Merci You Later in the crease and slightly above it. I used Marseille the Word on my lid and blended the shades together. Lastly I blended the littlest bit of Eiffel for You in the out 2/3 of the crease. Tarte Cheek Stain in True Love starting at the top of my cheeks blending down to my the apples. 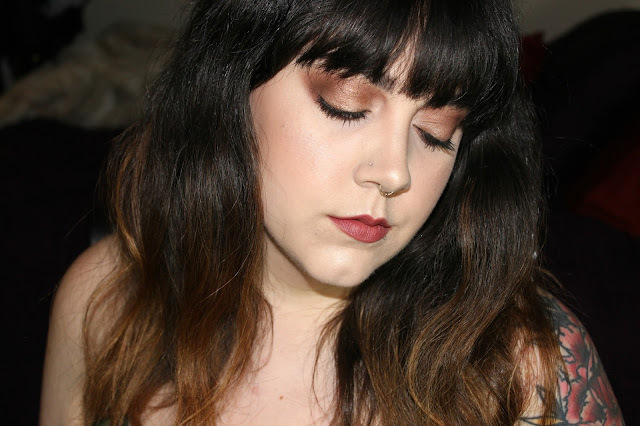 Too Faced Candlelight Glow Highlighting Powder Duo on the high points of my face. face. I also paired this look with a ballerina style bun in my hair and I think it goes quite nicely. I hope you are having a happy holiday season, no matter what you celebrate. I will be taking this Wednesday off blogging, as it is Christmas Eve. I'll be back on Friday with a fun post and I'll return to my normal blogging schedule. All my most festive love!